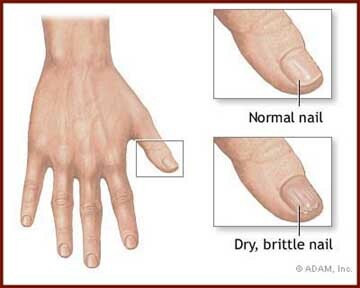 BRITTLE NAILS - What causes a dry brittle nail? Biotin vitamin can strengthen nail growth! Brittle Nails - What Causes a Dry Brittle Nail? Causes, symptoms and healthy nutrition tips: Biotin vitamin can strengthen nail growth. Brittle nails are usually not associated with a medical disease. Brittle fingernails are a common condition, occurring in about 20% of people; more women than men develop brittle nails. Brittle nails usually break or peel off in horizontal layers, starting at the nail's free end. Everyone has brittle nails to some extent, some more than others. Aging can cause slowed nail growth and dull, brittle, or yellowish nails as the flow of moisture and natural oils to the nail bed declines. A lack of moisture or too much moisture can worsen an already brittle condition. Dry heat, detergents, nail polish remover, or harsh chemicals encourage cracked and dry brittle nails. On the other hand, too much moisturizer, hand lotion and a lot of time underwater leaves nails too soft for tearing. The nutrition for dry, brittle nails includes the establishment of a healthy diet and ways that continuously enhance the condition of the brittle nails of the person and the increasing desire to stay away from fatty, junk foods. Dry, brittle nails is a problem that thousands of women face. Nails dry-out in the winter time because of intense hand washing to stay healthful and because of all the dry air that is around generated as a result of heaters. Health Nutrition aids to control your fingernail health and provide a cure for dry, brittle nails. A inadequacy of B-complex vitamins, specifically biotin, will create ridges along the nail bed. Biotin vitamin can strengthen nail growth; therefore it is often recommended for strengthening hair and nails. Consequently, it is found in many cosmetics and health products for the hair and skin. A diet deficient in calcium inflicts to dry, brittle nails. Quite a number of vitamins and minerals have been proposed for the prevention of a dry brittle nail. and lastly, the control of potential dangers and hazards linked with the nutrition management. For people with mild or intermittent brittle nails, a cosmetic moisturizer may be enough to keep the skin from feeling dry. Use a glass file or an emery board instead of a metal nail file. Also, make sure you file only in one direction. Therapeutic moisturizers, which have been shown to act as a barrier that keeps water from evaporating from the nails. Calcium-rich foods include all dairy foods, especially yogurt, dark green leafy vegetables, almonds, beans, and sardines. Refrain from biting your nails. To help, kick this habit keep nails short, and paint them with a dark coloured polish. (Every-time you bite you'll be conscious of chipping the polish). Nail polish remover. Using nail polish remover more than once a week, especially one containing acetone, can cause your nails to become dry. Nails, should be neatly filed and shaped on a regular basis. For under the nail cleanliness use a nail brush and for smooth and shining nails use a nails buffer. Try a cuticle softener, for it might prove worthy. Malnutrition, Raynaud's disease, low thyroid function ( hypothyroidism), lung conditions, skin diseases ( psoriasis, lichen planus, alopecia areata), endocrine disorders, tuberculosis, Sjogren's syndrome, or Selenium poisoning.